There are lots of options to get to downtown Toronto from Pearson Airport. Emma and Stewart present this Moving2Canada guide, so you can start exploring the city! There’s a lot to do when moving to a new city. Working out how to get from the airport to your destination is probably not high on your priorities, but it’s important nonetheless. In Toronto, like all big cities, the main airport — Pearson International — is miles from downtown. Without prior research, getting from this Toronto airport to downtown can be overwhelming. With a bit of research, however, you can plan a solution fitted to your needs and budget. So read on for our lowdown on your options for getting out of Pearson Airport and making the first real steps on your adventure! If you’re new to Toronto, above to move, or just visiting, make sure to visit our complete Toronto city guide. 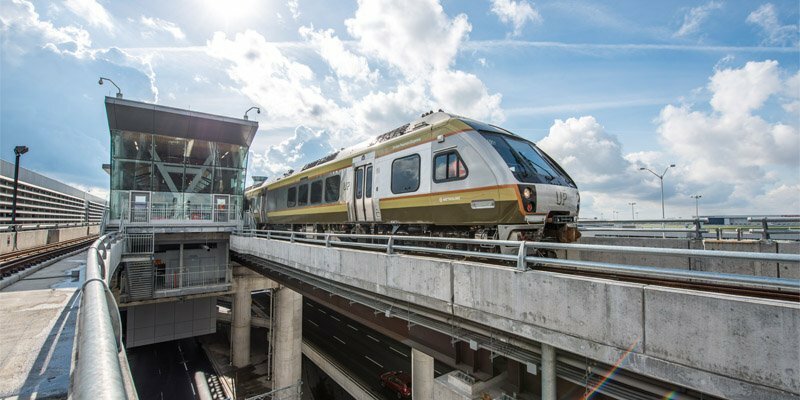 Toronto’s newest train takes you directly to Union Station from Pearson Airport. Credit: Rick Radell. The UP Express is Toronto’s direct, 27-minute rail link between Pearson Airport and Union Station in the heart of downtown. It is probably the easiest and quickest way into Toronto from the airport. The ride onboard is smooth, quiet and comfortable. There’s free WiFi, and ample space for big suitcases. The staff are very friendly and welcoming. There are additional stops at Weston and Bloor along the way. The latter provides a chance to make a slightly convoluted transfer to the TTC subway and streetcar network (extra fare required at this point), if downtown isn’t your final destination. Tickets can be purchased in advance, or from ticket machines at Pearson Airport, and an adult fare costs $12. If you’ve arrived at Pearson’s Terminal 3, then follow the signs to ‘Train to city via Terminal 1’. Take the free shuttle train between terminals, and once at Terminal 1, look for the ‘Train to city’ signs. Pros: Quick, comfortable, frequent, convenience and the ease of moving your luggage. Cons: Cost compared to the TTC. Particularly, if there are many in your group, and if you need to transfer to the TTC. The TTC 192 Rocket bus connects you straight to Kipling Subway station. Sadly, there is no TTC (Toronto Transit Commission) subway connection to Pearson Airport, hence the UP Express. Instead, there are a few TTC bus routes that serve Pearson Airport. The most popular, and the one to get downtown, is the 192 Rocket express bus. Pick up from either terminal 1 or 3. Ask the driver for a transfer, and ride the bus to Kipling subway station. Subway Line 2 will take you from here into downtown Toronto. You can then change onto the Line 1 subway, or a streetcar or bus route, if needed. You only pay the one fare — the one which you used to board the bus at the airport — for your entire journey from Pearson Airport on the TTC. Just make sure you pick up that transfer from the driver. A cash fare costs $3.25. However, the driver does not provide change. Alternatively, purchase a ticket from a vending machine, such as those in terminal 1. The machines accept cash and credit cards. Don’t worry about needing exact change for your bus. 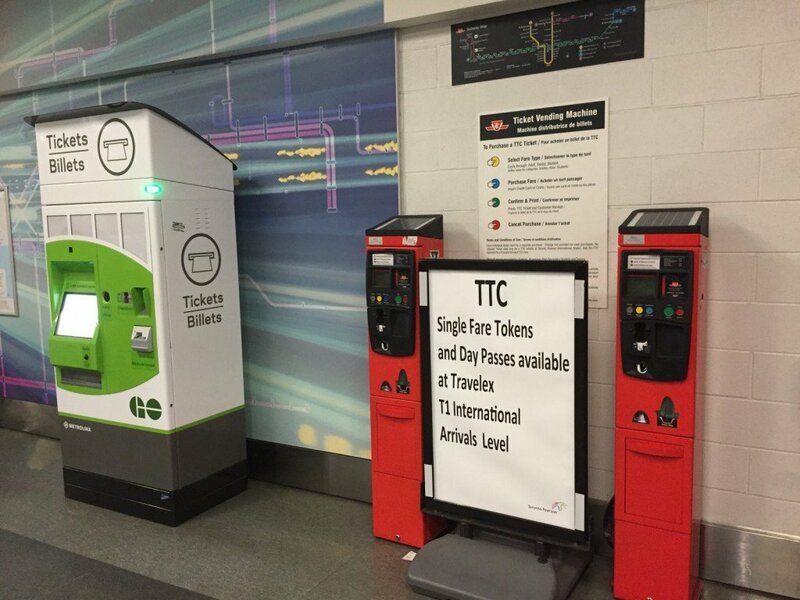 You can use your credit card to buy tickets for both the TTC and GO Transit from vending machines. For more on the intricacies of the TTC fare system, check out our Guide to the TTC. To find your TTC bus, follow signs for ground transportation/public transport/public transit. Pros: Cheap, and you can get anywhere in the city of Toronto with the fare you paid at the airport. This is providing it’s still part of the same journey. Cons: The 192 bus can get busy. You’ll also need to make at least one transfer on your journey. Not always fun at the end of a long flight with heavy bags. Use the Uber app to select your journey from Pearson Airport. Uber might be controversial, but remains on Toronto’s streets. Expect to pay a fare starting at approximately $69. There will also be a $15 airport pickup surcharge for a ride to downtown. Uber fares can of course be subject to surge pricing increases. Book via the Uber app. You’ll need a registered account and payment details. Choose what type of vehicle you want. The bigger and nicer cars will cost more. Pros: Convenient, on-demand, and no need to carry cash. Cons: The cost, and, at time of writing Uber still isn’t legally approved in Ontario. A more conventional mode of transport than Uber. Taxis and their more luxurious cousins, limos, are of course readily available at Toronto Pearson Airport. Expect to pay around $53-58, plus a fuel surcharge and tip, for your trip into downtown Toronto. Follow the signs for Taxi/Limo to find a ride. Pros: You pay a flat rate fare. Cons: Cost compared to public transport. Keep an eye out for public transit/ground transportation/public transport to find local bus services, including the TTC. GO Transit, operate regional services across the Greater Toronto and Hamilton Area (GTHA). GO bus routes from Pearson Airport (terminal 1 only) go to North York (Toronto), Hamilton, Oakville and Mississauga. Follow the signs for ground transportation/public transport/public transit to find the GO buses. Tickets can be purchased from a vending machine, such as in terminal 1, as well as from the driver. GO fares are calculated based on distance travelled and your passenger type, but expect to pay $6.00 – $11.55. Pros: Useful if you’re going across the GTHA, and there are few stops, as it is not a local bus service. Cons: Limited to selected destinations. If Toronto isn’t your destination, then public transport operators for neighbouring Mississauga (MiWay) and Brampton (Brampton Transit) also serve Pearson Airport (terminal 1 only). Cash fares (exact change) are $3.50 (Mississauga) or $3.75 (Brampton). Pros: Great if you’re going to Mississauga or Brampton, and not downtown Toronto! Cons: There is no subway or light rail service to connect to in either Mississauga or Brampton. So there we have it. There are plenty of options. Finding the best one for you depends on your destination, budget and number of people in your group, and how lazy you feel after a long flight! For more from Emma and Stewart, visit their blog. We also highly recommend you keep up-to-date with latest immigration developments. As anyone will tell you, changes happen regularly that can affect your move. You can do this by downloading our Getting Started Guide to get our free immigration and settlement guide. This will opt you in for free, relevant updates into your inbox. Thank you to UP Express for providing complimentary tickets for the purpose of this review. UP Express is a division of Metrolinx. At time of writing, Stewart and Emma were both employees of Smart Commute, a program of Metrolinx. The impartiality of this review was not influenced by the authors’ connection with Metrolinx.